This week, I led a press conference to reintroduce legislation to amend the Pennsylvania Constitution to add a victims bill of rights. Last session, Marsy’s Law passed in the House and Senate unanimously. An identical bill must be passed this session before the question is placed on the ballot. 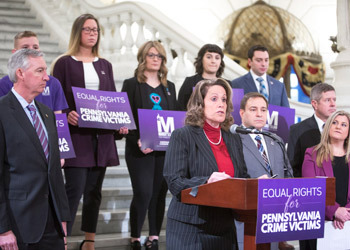 While Pennsylvania has protection for victims written into its laws, a constitutional amendment is the only way to ensure that victims have equal footing with offenders and the only way to ensure that victims have some kind of redress when their rights are violated. The amendment would require notice of hearings and other proceedings, physical and emotional protection from the accused, notice in cases of release or escape, proceedings free from unnecessary delay, the ability to confer with the prosecutor in the case, full and timely restitution from the offender, and notification of all of these rights. Pennsylvania residents may soon face a crisis in health care, if the state courts repeal a rule that helped stave off a similar situation more than a decade ago, when physicians left their practices, moved to other states or retired early due to skyrocketing insurance premiums. The rule currently requires medical malpractice cases to be brought in the county where the alleged malpractice occurred. Repealing that rule could lead to patients having to say goodbye to their physicians or patients having to drive farther for care. Additionally, recruiting physicians and specialists would be difficult, and medical innovations may be halted. Overall, patient care would suffer and everyone would face higher health care costs. This week, the House Majority Policy Committee, of which I am a deputy chairman, hosted a forum to examine the issue and hear from numerous stakeholders about the negative impact this rule repeal could cause. To learn more about the issue, click here. The General Assembly is expected to submit its comments to the courts, but you can also let the courts know how this would impact you. Click here to submit your comments by Feb. 22. On Tuesday Feb. 5, Gov. Tom Wolf will unveil his budget proposal for fiscal year 2019-20. We are looking forward to hearing the governor’s proposal and reviewing the details in the coming weeks as the Appropriations Committee will begin its series of hearings on the proposal on Feb. 11. You can watch the address on my website at 11:30 a.m. Applications for the Property Tax/Rent Rebate Program are now available on my website, and at my district office. The program is designed to help eligible Pennsylvanians age 65 and older; widows and widowers age 50 and older; and people with disabilities age 18 and older to receive up to a $650 rebate from the property taxes or rent they paid last year. Residents should not pay a private entity for assistance in filing the forms. Copies of the forms, as well as assistance with filing them, are available at my office at no cost. Applicants should be prepared to provide all the necessary income, property tax or rental information required to process claims quickly and accurately. Applications are due by June 30. 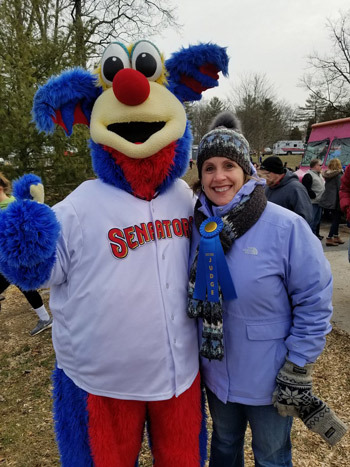 •	I attended and volunteered as a costume judge at the Special Olympics Area M’s 14th annual Polar Plunge. The event was held at Gifford Pinchot State Park. Participants braved very cold water. Money raised supports Special Olympics athletes. •	The Cumberland York Area Local Defense Group (CYALDG) recently met at the New Cumberland Defense Logistics Agency. The group works to coordinate, advocate, develop and implement recommendations to enhance the military value of our three local installations: the Carlisle Barracks, the Naval Support Activity Mechanicsburg and the Defense Distribution Center Susquehanna in New Cumberland. These three facilities have a significant economic impact on our communities. 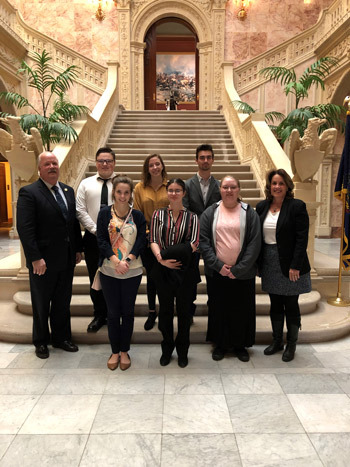 •	Students and administrators from Cumberland Perry Area Vocational Technical School visited the Capitol this week to advocate for the importance of career and technical education. I was able to meet with six students. One, Hailey Ott from Mechanicsburg Area School District, lives in the 88th Legislative District. •	Encompass Health held a ribbon-cutting ceremony on Wednesday to celebrate its recent rebranding. Encompass Health Rehabilitation Hospital, formerly HealthSouth, is located in Upper Allen Township and offers an array of rehabilitation services.